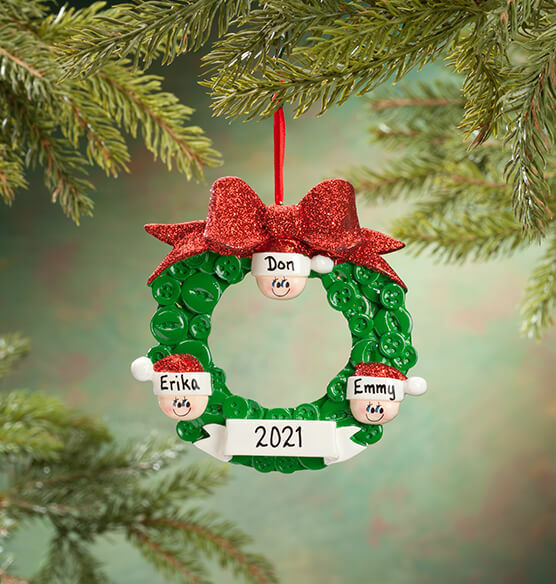 Like a circle of love, this Personalized Wreath Family Ornament's smiling faces don red Santa caps—and each can be customized to represent your family, co-workers, book club or circle of friends. 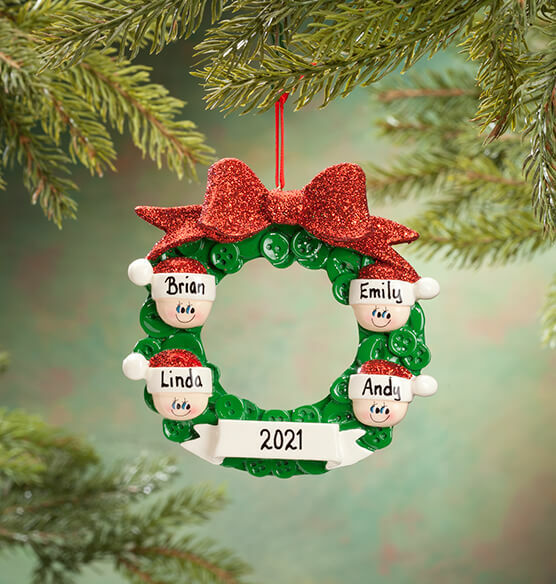 Let us know the size of your family or group, and we'll add 3, 4, 5 or 6 names to each glittery red cap—plus any year on the wreath's white banner. Specify first names; limit 1 line per Santa hat, 8 letters/spaces each. Specify year; limit 4 characters. Resin. Christmas ornament measures 4 1/4" dia. 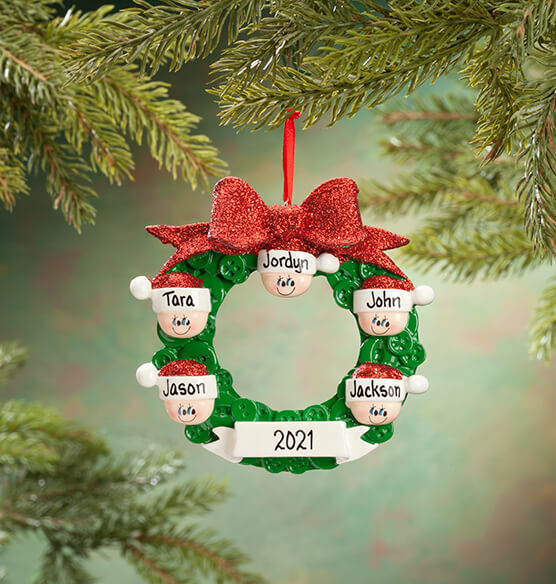 No Personalization Family of 4 , Personalized Family of 4 are not available at this time. Very beautifully done. I love it! This contains the names of my six grandkids. It is well crafted and brightens my tree. i was pleasantly surprised of the quality and worksmanship of this product. I would purchase it again and would recommend it to everyone. I would buy this ornament for someone else because it is the perfect gift for a new baby in the family. 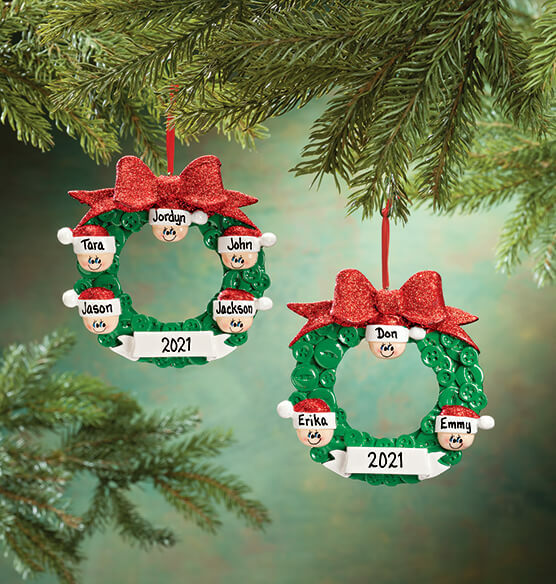 An ornament is a great gift because those people would think of you every time they put it on the tree. Larger than I thought...very cute! I love this ornament. It is well done although just a few small places that are missing glitter...not enough to be noticeable though. Larger than I thought...good value for the price. Beautiful and personal. I have already received 2 of these and wanted more. BEST ANSWER: Thank you for your question. This is made in the USA. We hope this information will be of help to you.